We’re not entirely sure where the last month or two has gone so as the end of the year fast approaches, we’ve stopped, took a breath and realised we have yet to formally introduce our final cohort of this years graduate training programme (The Grad Scheme). 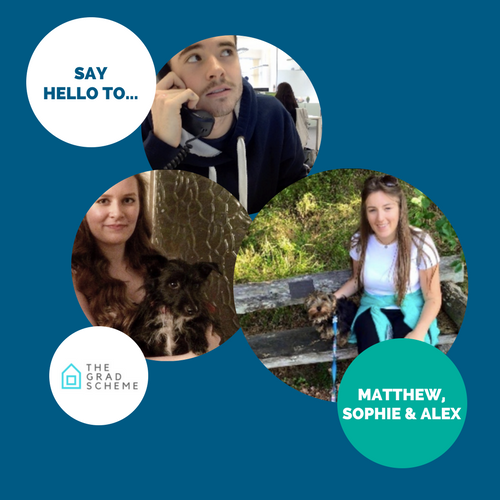 Everybody, say hello to Sophie, Alex and Matthew (more affectionately named Mash!). We held an Assessment Day back at the end of September with 10 fresh-faced graduates wanting to join the Para-Sols tribe but there was three stand-out personalities that took the spotlight that day and made the decision an easy one for the management team. They started with us mid-October at what was, and still is, an exciting but pretty chaotic time and were well and truly thrown in the deep end. Fast forward 6 weeks and thankfully for us, they’re proving to be strong swimmers!